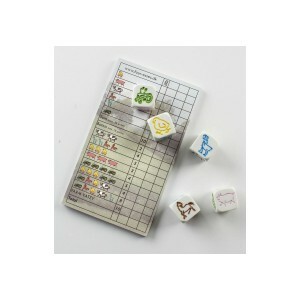 Author HelenPosted on 5th November 2015 10th November 2015 Categories 100 days of happyTags CFS, farm yatzy, fatigue, mindful, nephews, yahtzee8 Comments on Day 73: Yahtzee! Day 71: Yoga every damn day! I LOVE LOVE LOVE yoga. This is my third post about one of my most treasured rituals, and why not, it deserves it: yoga is an integral part of my life, my wellbeing and my healing journey. I find stretching my body with a yoga session wonderfully delicious, and even more so with all the bed rest I currently have to take. I also find it soothing and peaceful for my mind and soul, and it’s another opportunity to practice mindfulness. Not being able to practice as much as I used to has been one of the frustrating things about having CFS. Due to the nature of the condition, my practice is quite sporadic as I sometimes simply don’t have the energy, or my neck is feeling too painful from when I sustained a severe whiplash injury a couple of years ago. Over the last few months, I’ve been able to get back on the mat which has lifted my spirits no end. And recently, I’ve even managed to go to a couple of classes and would love to build up slowly to attending regularly. But all in good time. In a good week, I’m managing to enjoy two very gentle sessions at home, alternating between my two favourite short practices on DVD. But lately I’ve been feeling a little bored with my practice as I know them off by heart. I think it’s time to shake things up a little. And I’m feeling optimistic that my body can handle a teeny bit more . 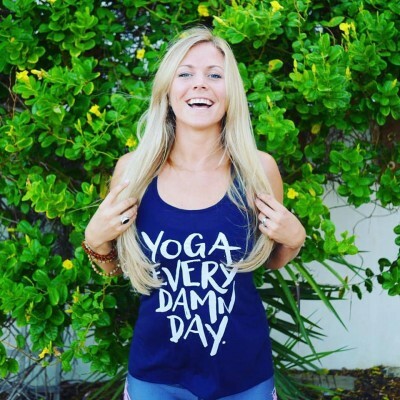 And I’m loving the gorgeously inspiring Rachel Brathen’s mantra: “Yoga Every Damned Day”. Sooooo, I’ve decided to try and make November ’30 Days of Yoga’. After some googling, I’ve found a lovely online teacher called Erin Motz who offers a free 30 day yoga challenge. It’s “30 days of yoga in 10-20 minute long online video sessions which we send you directly to your email inbox one day at a time.” Which sounds perfect for my limited energy levels. I like that there’s a different focus for each day’s session; day 2 is for chest and shoulders, day 3 is for posture, day 4 is for abs, and so on. 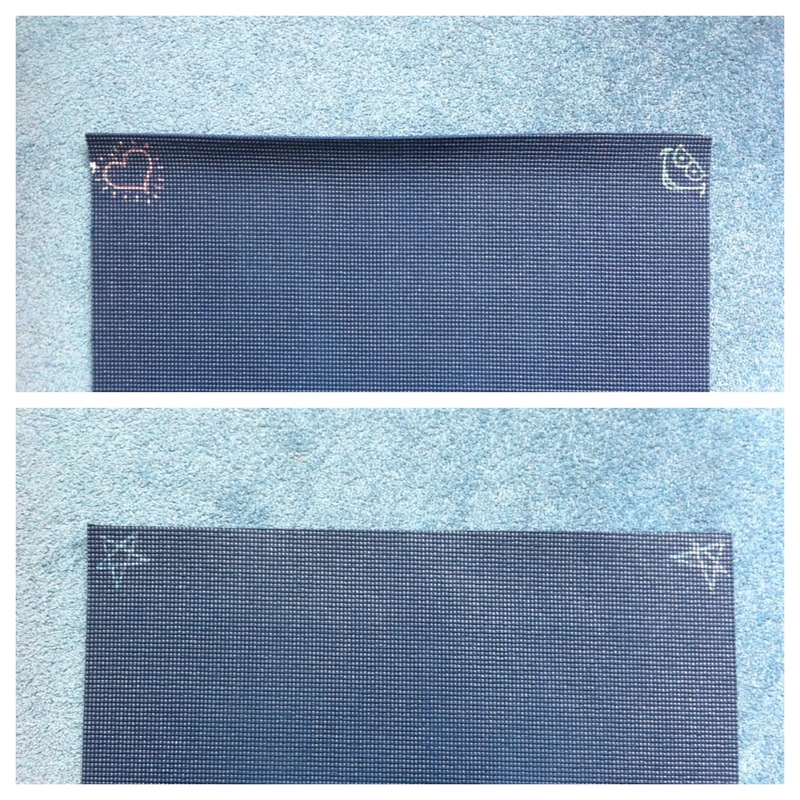 I’ve signed up, I’ve pimped up my yoga mat, and I’m ready to go. I am giving myself permission to skip a day or two if I need to – if my CFS symptoms are too intense, or if my neck is too sore. But I’m really hoping I can try and attempt each day’s session. And if not, I will see if I can manage a sun salutation or even one little downward dog! And if not, I will at least be able to meditate. No pressure, no worries, all is well. So with this in mind, my happy for today is being grateful for my yoga practice, being mindful as I roll out my mat every damn day this month, and being kind to my body by doing lots of yummy stretching. Author HelenPosted on 1st November 2015 10th November 2015 Categories 100 days of happyTags CFS, fatigue, grateful, kind, mindful, yoga4 Comments on Day 71: Yoga every damn day! There’s been a new online interview between the host, the very lovely Melli O’Brien, and a leading mindfulness expert every single day. Those who have shared their insight and wisdom with use include Mark Williams, Jon Kabat-Zinn, Jack Kornfield, Tami Simon, Dr Rick Hanson, Ruby Wax, Arianna Huffington, Vidyamala Burch and many many more. 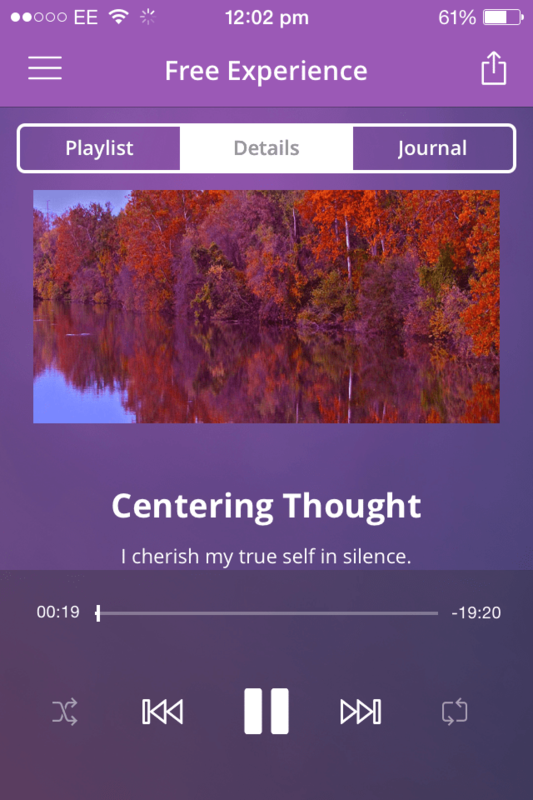 There’s also been presentations and practice sessions, plus a bunch of free meditations to download and keep. I’m delighted that I’ve managed to watch most days, I think I’ve only missed three. And I’ve loved each and every one. The Summit has given incredible insight into the science behind mindfulness and its clinically proven benefits, and a plethora of different mindfulness techniques on how to integrate mindfulness into everyday life and how to apply it to specific situations. I’m looking forward to having a play with some of these techniques to see what works for me. As I’ve mentioned many times before, mindfulness has become a huge part of my healing journey. And this series of interviews and presentations has highlighted how beneficial and enriching mindfulness is to my wellbeing. I can say with hand-on-heart, that practicing mindfulness will continue to be a part of my everyday life, ongoing. And tonight, to close this incredible month, was a live guided meditation with Jon Kabatt-Zinn. It felt incredibly powerful to be meditating with thousands of others around the world at the same time. I shall sleep very soundly tonight! So with this in mind, my happy for today is being grateful for, and mindful during, the Mindfulness Summit. PS While the Mindfulness Summit has now finished, it’s available to purchase and 100% of profits generated from the project will be donated to mindfulness charities. Please click here for more info. Today was the ultimate Artist’s Date: I went to the seaside. Since moving back in with my folks in the middle of England while I recover from CFS, the nearest coastline is sadly about 80 miles away. And I desperately miss living by the sea, which I find so powerfully healing. So on a good-health day not so long back, I booked myself onto a day trip to the seaside with a local coach firm. However, due to my recent cold and CFS blip, I wasn’t really sure if I was up to going. But as the seaside towns are winding down for the winter, today was the last seaside trip the coach company was making until the spring, so I was really keen to go. As I woke up this morning, my body craved more rest and begged me to stay in bed, but my heart skipped with joy at the thought of a day at the seaside. Reluctant to cancel, I felt confident the healing power of being by the sea would lift my spirits and soothe my soul, and would offset the inevitable consequences of complete bed rest for the next few days. As the full, chattering coach weaved its way through the countryside, I put down my book to gaze out the window. And my, how I was rewarded: blanketed in mist, my heart sang with joy at the splashes of glorious golds, flaming ambers and dazzling rubies of the stunning autumn scenery. Arriving at the seaside just before noon, I headed straight for the beach so I could say hello to the sea. 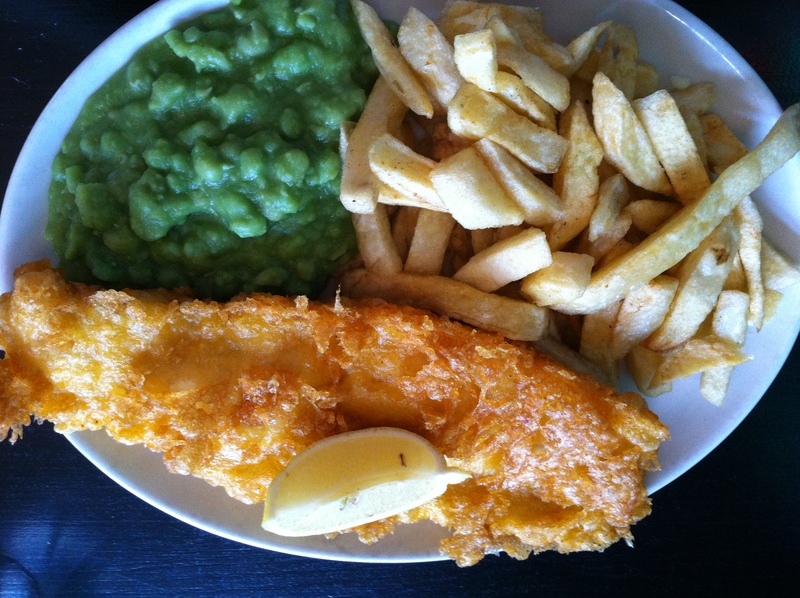 Then it was time for a spot of lunch, and of course there’s only one option when you’re at the seaside: fish, chips and mushy peas of course! My ‘regular’ sized portion beat me; convinced it was big enough for two, I was curious to see how big the ‘jumbo’ portion would be! I wandered down the pier and spent a lovely half hour gazing out to the sea, soaking up her powerful healing energy. Then it was time to whip my socks and shoes off and hit the beach. Walking barefoot in the sand is one of my all time favourite things to do, and it felt blissful getting sand and sea in-between my tootsies once again. I continued to walk along the beach and it was blissful having this long stretch of beach almost to myself, only passing by the occasional dog walker. I was feeling quite tired and as I came upon some rocks, I decided to buy a herbal tea and come back and watch the waves for a little bit longer. Oh boy, finding a herbal tea in the many beachside huts was almost impossible. Ten stalls and 30 mins later, I rejoiced at finding a place offering lemon and ginger tea, and went back to sit on the rocks. I tuned into my senses and fully appreciated the delights surrounding me: the sound of the crashing waves and squawking of the gulls; the sight of the muted watercolour tones, as the sand merged with the sea, and the sea with the sky; the smell and taste of the salty sea air; and the kiss of the gentle breeze on my skin. Pure bliss. I was delighted to see two kite surfers glide into view. I was utterly mesmerised. I used to love watching the surfers when I lived in Australia, I find it so soothing and meditative. I was also transfixed by the icy blue eyes in the sky, gazing out of the clouds. Then it was time to make my way back to the coach station for my return journey home. 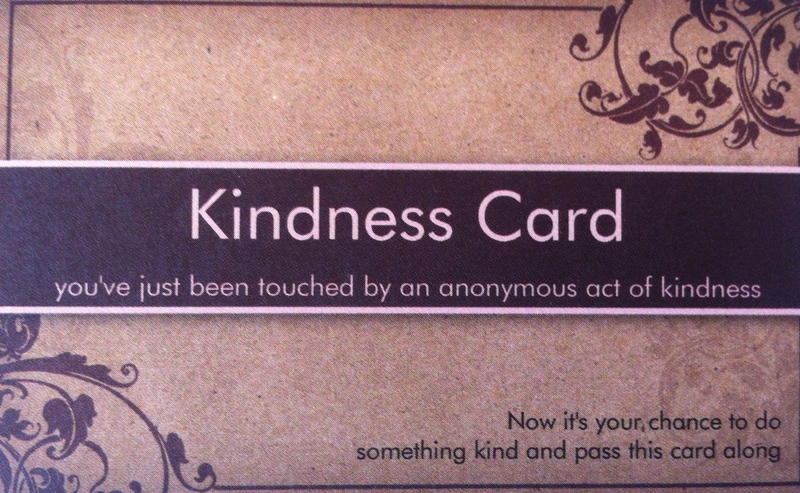 As we arrived back, I gave the coach driver one of my kindness cards with the message: “Thank you for being a good, considerate driver” to show him how much he is appreciated. After my long but blissful day at the seaside, my spirits are lifted, my soul is soothed, and my body and energy levels are kaput! So with this in mind, my happy for today is being grateful, mindful and kind, while enjoying a day at the seaside. My mum always spoils us on our birthdays. My sister and I grew up feeling extra special on our birthdays as mum showered us with her love and kindness, and she still does. I also like to spoil my loved ones on their birthdays too. Today is my nephew Callum’s 7th birthday and even though I’m unable to shower him with extravagant gifts, I can shower him with my love and attention, and try to be the best Auntie I can be. We FaceTimed him this morning before school to sing Happy Birthday, and it was lovely to see him looking so happy and excited. Later, after Mum had picked the birthday boy up from school, he excitedly tore open our pressies. 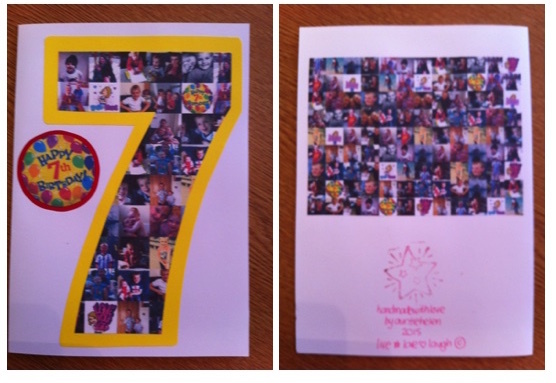 I’d also made him a special birthday card, creating a number 7 filled with lots of photos of him. I was over the moon at his reaction when he first saw the card: “WOW” he exclaimed wide-eyed and open-mouthed. And I got another WOW when he turned over to see more photos of him I’d printed on the back. Bless. As the rest of the family arrived, we played a variety of games, being mindful to let the birthday boy choose which ones, and I even attempted a game of ping-pong with his new table tennis kit. 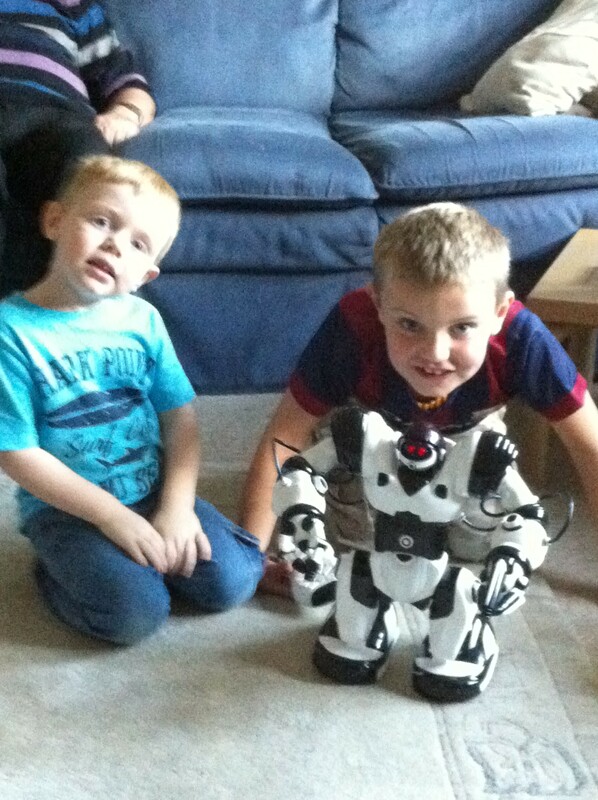 He proudly showed us his main pressie, an amazing robot. The remote-controlled Robosapien dances, burps, does karate, kicks and speaks fluent caveman among other things. It was especially funny to see his younger brother Thomas dancing along. We ordered a Chinese meal as Callum adores Chicken Chow Mein and Prawn Toast. As we all went to sit at the table, I asked Callum where he wanted to sit: “Next to you” came his reply. Heart-melt moment. Then, as Thomas arrived, he had a tantrum as he wanted to sit next to me. So after a bit of shuffling, I was the proud Auntie sandwiched between my two munchkin nephews. 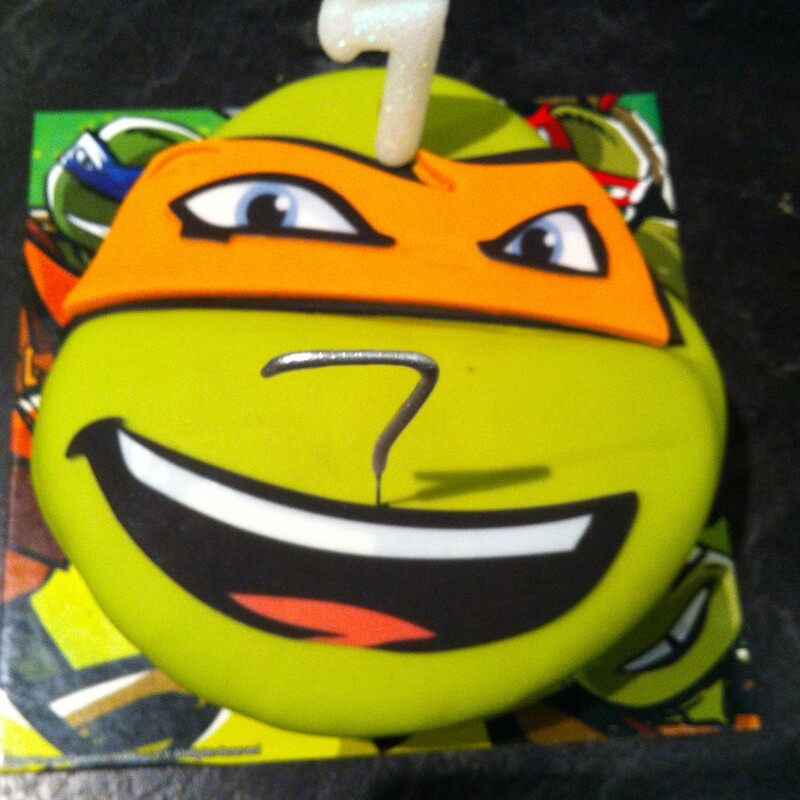 After dinner it was time to blow out the candles on his birthday cake: a fabulous Ninja Turtle cake with candles shaped in the number ‘7’. Soon after, it was time for Auntie Helen to go home and rest up, as I was feeling exhausted and also still suffering with my cold symptoms. I feel really happy that Callum has enjoyed his birthday celebrations and is looking forward to going bowling with some friends on Sunday. So with this in mind, my happy for today is being mindful of being a good Auntie to Callum on his birthday, and beyond. As today is a bed rest day, I find myself looking out of my bedroom window, watching the wild weather. As the magnificent trees sway to the back and forth in the furious wind, it looks like they are performing the most incredible dance. I think it’s the Tango: vibrant, dramatic, full of passion, and playful. So with this in mind, my happy for today is being mindful while watching the trees dancing in the wind.